At Easter I spent 2 weeks in North Sudan on a “busman’s holiday” on an archaeological project with Professor Anna Boozer of City University New York, and formerly a lecturer of Roman Colonialism here at the Archaeology department. I had worked with Anna at Amheida Egypt in 2013, and the original plan for the Easter holidays had been to go back there for another season of digging and recording at the domestic Egypto-Roman house. 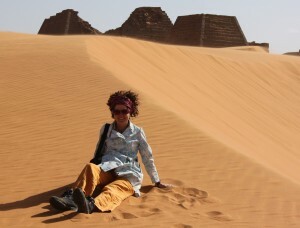 Sadly, but unsurprisingly given the political climate, we could not get a permit to work there this year, so Anna quickly organised an alternative season on her other project at Meroe – A Royal City of the Kingdom of Kush on the east bank of the river Nile, 4 hours drive North of Khartoum. This project had been conceived by the University of Reading Internationalisation Team, with collaboration with the University of Khartoum. The aim of the Meroe Archival Project, as it is known, is to record artefacts (and for me, to draw them) excavated by the late Peter Shinnie, in the latter half of the 20th century. He published many of his excavations, but being very prolific in excavating, he did not publish everything. Anna is keen to excavate there herself, but feels she must first record and publish what she can from Shinnie’s backlog. Other archaeological teams have been excavating there extensively over the years too, and it all comes across as rather ad hock. 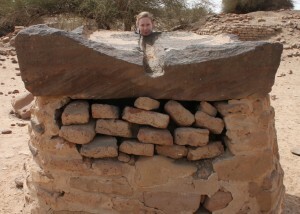 Anna is also looking at Meroe on behalf of UNESCO. The artefacts reside in both a crumbling old dig house at Meroe, where we worked and resided for 5 days, on the edge of the Royal City itself, and also at the Khartoum Archaeological Museum. I had a long journey via Doha where I arrived in the middle of the night with 7 hours to wait for my connection to Khartoum, and chatted to 2 interesting shop assistants, a young man from the Philippines, and a young woman from China minding a shop selling $20,000 Chanel watches (yes I tried one on, and it didn’t suit me), who wanted to know about dating (non-archaeological dating) in the UK; who pays for dinner, the man or the woman (in China it is always the man), and we discussed gender issues in general. I had been in the thick of editing the Gender and Fieldwork videos for the last couple of weeks so it was a hot topic for me. 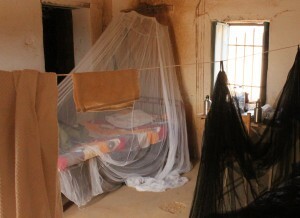 So now I come to the point of why I offered to write a Gender and Fieldwork blog post about this trip. Our team comprised of 5 women. Anna and Liz (Americans) recording small finds, Angela (Italian), also a small finds specialist and specialising in faience, Hannah, a Sudanese student placement learning a variety of tasks and worth her weight in gold for her translation skills, and myself, drawing what was put in front of me. The stereotype is that finds specialists are more often than not, female. 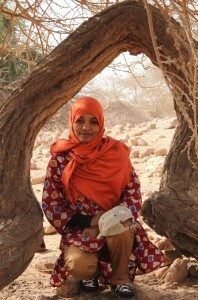 Our Sudanese student happened to be female but we didn’t know who we were getting, and last year it was a young man. I doubt that there was any deliberate selection of an all-female team by Anna, other than for logistical (room sharing) reasons, but essentially the team comprised of 4 friends who had worked together on numerous occasions and were not only a known quantity professionally, but a guaranteed fun social mix. We are all multi-skilled archaeological fieldworkers as well as finds specialists. Personally, I have never worked on an all-female team before. I grew up the daughter of a scout leader and spent every summer holiday from 6 months old to 16 being the only girl amongst a group of 20 or so boys. I was consequently very competitive and determined to be faster at the assault course than the lot of them, and quite a tomboy. 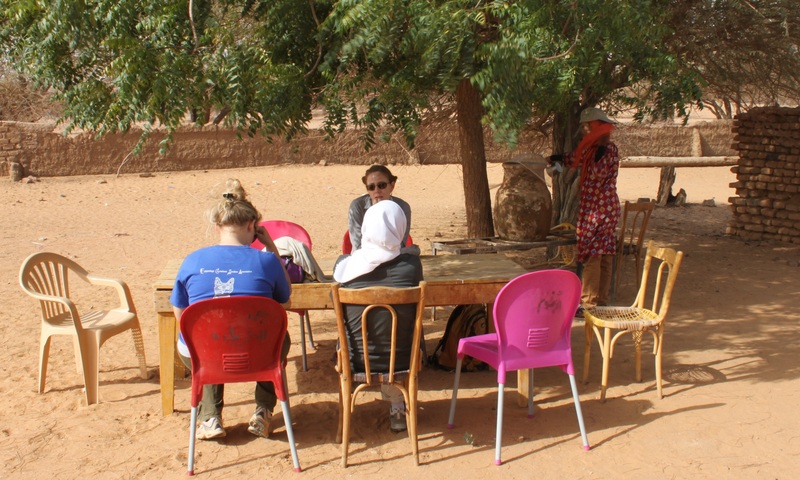 Our Meroe project consisted of like-minded, independent no-nonsense, shisha smoking, adventurous women, amongst whom there was a lot of support, both work wise and personally. In particular, I felt very much cared for as I developed a horrendous cold within hours of arriving at the Meroe dig house, which within a week developed into sinusitis. I was given a constant supply of vitamins and drugs, Carcady tea, fresh lemon and sugar, cough sweets, and finally a course of antibiotics by my kind nurses as I drew finds with tissues stuffed up my nose for fear of dripping on my drawings. We worked seriously hard during the day to record as many finds of the categories that Anna aims to publish this year and at mealtimes and in the evening we laughed a lot about absurd things and talked about archaeology (of course) but also about cats, weddings and hair! I observed this with the Gender stereotype in the forefront of my mind, with some amusement. Well, we all own cats, Anna is getting married in a few months time and is in the midst of planning, and people always talk about hair when I’m around. We also met up with a few interesting ex-pats working on humanitarian and environmental projects, all of whom happened to be men. At these gatherings we gossiped about functions at the various Embassies, discussed the virtues of a good whisky, and talked about our work. I am aware how little I have talked about the work, or Sudan or the archaeology in this blog, but I fear I have already written 1000 words, so the rest will have to be described in photographs. I will just end by saying that the best thing about Sudan is the people. They are so friendly and welcoming to foreigners. They don’t get many foreign visitors and look at you with friendly curiosity. Sudanese women seem to have equality. We met many women working in quite senior roles at the museum, and female university students, but needless to say, the head of the Ministry of Culture and Heritage is not a woman. In Meroe however, women were powerful rulers: Wikipedia says: Candace of Meroë is a legendary queen of the Kingdom of Kush and Queen of Nubia. The legend says that she defeated Alexander the Great when he tried to conquer territories south of Egypt. Another story claims that Alexander and Candace had a romantic encounter.” Perhaps there is some confusion with 2 other Romano- North-African characters, but then, us girls love a bit of historical romance…? ! Sarah has worked in graphics and archaeological illustration for 16 years, and started her career as a field archaeologist. She teaches Illustration of artefacts on a Part 2 Archaeology module; Techniques in Artefact Interpretation, and Archaeological Graphics for Masters students. She has also worked as a supervisor at the Silchester Town Life Project since1998. 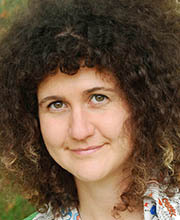 Sarah has worked full time for the University of Reading since September 2011. Prior to this, she worked for Oxford Archaeology, starting as a field archaeologist, and culminating as the Senior Illustrator for a busy Graphics office. During this time she was lead illustrator in a number of large publications, including the Thames Through Time series (which was a finalist in the British Archaeological Book of the Year awards), and Under the Oracle. 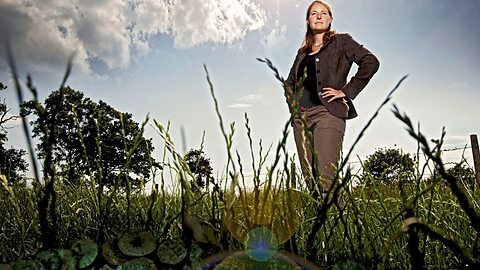 On 3rd February BBC 2 broadcast ‘Digging for Britain’ – ‘Professor Alice Roberts and archaeologist Matt Williams present 2014’s most outstanding archaeology. In the summer, archaeologists have been unearthing our history in hundreds of digs across Britain. They have gone to extraordinary lengths to uncover long lost treasures – retelling our story in a way only archaeology can. Must Farm: The Cambridgeshire site is called the Pompeii of the Bronze Age and gives an unparalleled glimpse of life 3,000 years ago. Colchester: Roman treasure hidden as Queen Boudicca rampaged through the town. Oakington: Burial rituals revealing the secrets of Anglo-Saxon childbirth. Lyminge: Investigating a mysterious Anglo-Saxon royal hall. Basing House: Examining the final days of this 16th-century Tudor complex. Silchester: Important Roman finds from the longest-running archaeological dig in the country tell of the Emperor Nero’s personal involvement.